Five minutes ago, I asked my younger sister who was playing in the Super Bowl. She answered, “Oh, I think it’s Madonna!” And THAT’s how into football my family is – we care more about the half-time show than the actual game (don’t worry though, I looked it up and now know it’s GIANTS versus PATRIOTS). Though the outcome of the Super Bowl really doesn’t concern me, concussions do, since they account for an alarming number of football-related injuries. According to Dr. Gail Rosseau,”The annual incidence of football-related concussion in the United States is estimated at 300,000, and nearly 45,000 football-related head injuries were serious enough to be treated at U.S. hospital emergency rooms in 2009″ (Bloomberg Businessweek). Concussions are a type of traumatic brain injury. A concussion occurs when your brain hits your skull. This could be caused by a number of incidents, such as a bad fall, a car accident, or a tackle in a football game. Concussions are tricky because some people don’t show any symptoms of having one, while others might suffer from memory loss, dizziness, and nausea. 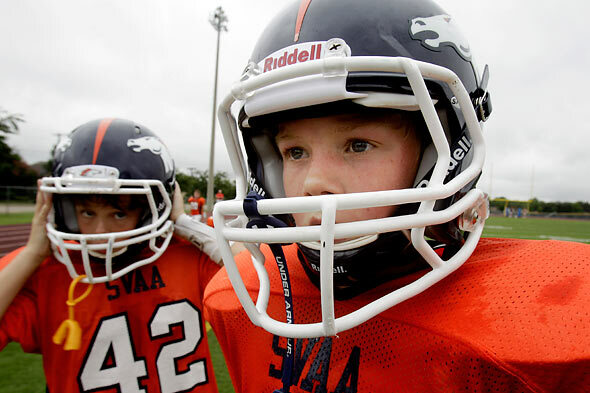 Concussions can be extremely dangerous, though many young athletes do not take them seriously. Dr. Sanjay Gupta, discussing his documentary about concussions and young football players in an interview with Sports Illustrated, said that “the best way to heal the brain is to essentially let it rest. No screen time. No texting. No reading for a few days. One of the players that we followed in the documentary was trying to exercise and lift weights during his healing period, and that’s a no-no. You really have to rest your body and rest your brain. It’s only when you’re completely symptom-free when you should be allowed back in the game” (Sports Illustrated). Though you might not believe it now, safety comes first. Also, be sure to check out Dr. Sanjay Gupta’s documentary called Big Hits, Broken Dreams.